Can you see those tiny butterflies popping up over the animals? 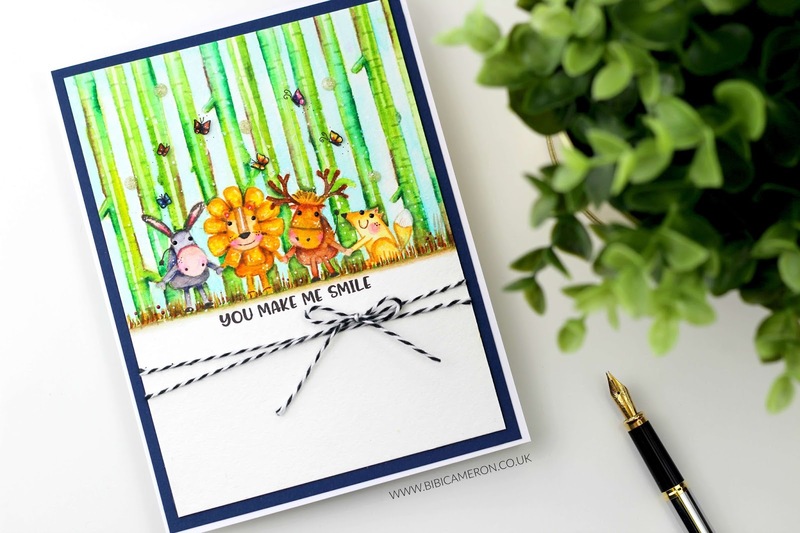 I think they add so much fun to this super cute scene using Best Friends Stamp Set by Simon Says Stamp. 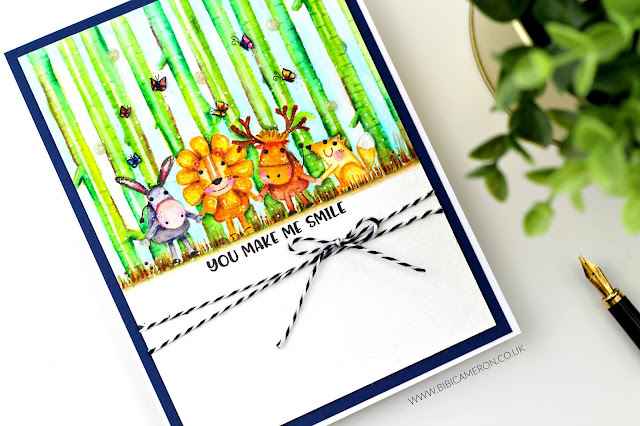 To stamp the trees in the background I used Into the Woods Again, a stamp by Clearly Besotted. The butterflies are from Curious Kittens stamp set by Honey Bee Stamps. 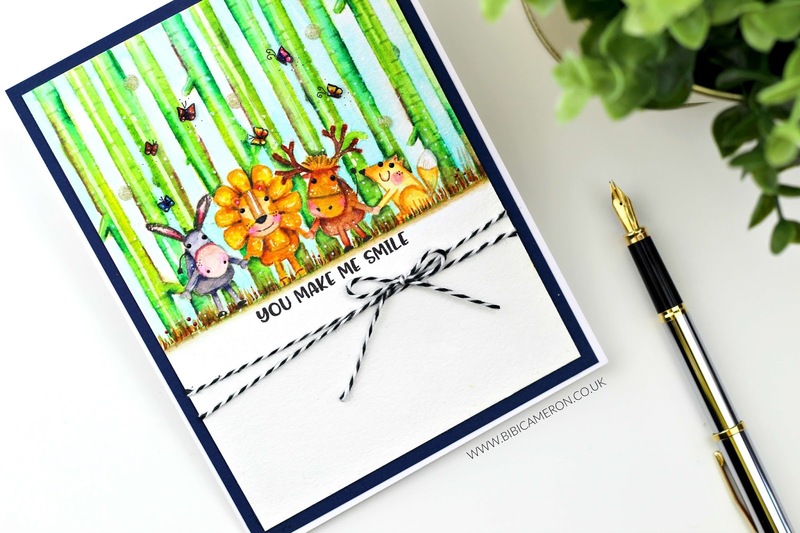 I stamped the animals using Antique Linen Distress ink on Canson watercolour paper. This paper have very little texture and I do love it for that. However, I feel I can't apply a lot of water on this paper so I worked with Zigs [Kuretake Clean Color Real Brush] and a water brush slight wet. I stamped the animals on printing paper and I trimmed the image to create a mask. I applied Stick and Spray by Crafter's Companion at the back of the printing paper as this is a temporal adhesive. 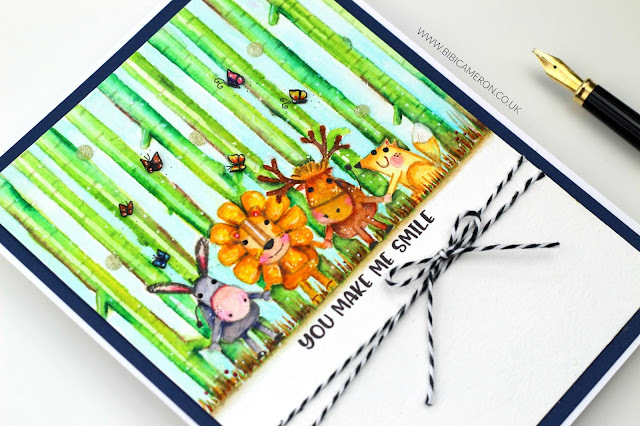 With the mask over the animals, I stamped the background also using"Into the Woods Again" stamp and Antique Linen Distress Ink. I then applied colour using Zigs (watercolour markers). Once the masking fluid was dry, I applied colours to the trees. I apply the markers directly on the paper and to spread and blend the ink I used a water brush. When the ink was dry I removed the masking fluid and then I applied a lighter ink over the area covered for it. I just wanted to add interest to the trees and make them look like Bamboo plants. I also applied the ink of a blue water based marker on an acrylic block and I mixed it with water to apply it in the gaps between the trees using a water brush. I stamped the sentiment using Black Simon Says Stamp ink and using the same ink I stamped the super tiny butterflies on Bristol paper. I applied colours to the butterflies and I trimmed them using mini snips by Tim Holtz. I glued them on the panel using funky tacky glue. I also added black and white twine and glittery enamel dots created with Nuvo Drops as I show in the video here .